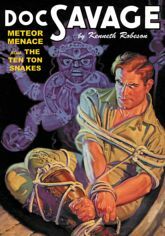 The pulp era's legendary Man of Bronze confronts threats from space in two pulse-pounding pulp novels by Lester Dent writing as "Kenneth Robeson." First, after the "Blue Meteor" horror brings near-fatal insanity to Ham Brooks, Doc Savage and his Iron Crew are spirited away to Tibet where they confront the mysterious Mo-Gwei to uncover the strange secret behind the "Meteor Menace." Then, a war hero's plea for help and a box of anaconda skins lead Doc to the danger-filled Brazilian jungles in search of "The Ten-Ton Snakes." Will Murray provides historical commentary while Anthony Tollin chronicles "Meteor Menace Around the World." This classic pulp reprint also features the original color pulp covers by Walter M. Baumhofer and Emery Clarke, plus Paul Orban's classic interior illustrations. Softcover. 7x10. Black & White.